A letter from Georgia Senator David Perdue in response to my comment on the Syria debacle provides insight into how the American system of government has gone astray. When elected representatives of the people diverge so far from their sworn duty to speak for us, it’s time we found new representation. The United States intervention in Syria and the Middle East has been billed as a “war on terror” to sell veiled militarism to the American people. But the reality of conflicts and proxy wars in the world is something altogether different. Here’s a cutting view on what’s gone wrong in our country. The proxy war waged in Syria against the government of President Bashar Hafez al-Assad is an illegally manufactured insurgency to overthrow yet another sovereign nation. Nobody with an inkling of understanding can deny this fact. When the insurgency was kindled back in 2011 by the government of Qatar, taking advantage of a decade old drought and other Syrian travails, our government hid the facts from us. The U.S. involvement alongside Saudi Arabia, Israel, and other regional players is by now well documented. U.S. and allied actions against Assad fueled a more widespread conflict, and CIA and other covert activities supported former U.S. enemies like Al Qaeda and eventually ISIL. The purpose of this insurrection is multifaceted to satisfy the greater Israeli and Saudi goals in the region, while at the same time cutting off energy flows westward from Iran and Russia. But the purpose of this report is not to rehash the Syrian conflict. My purpose is to show how key representatives in the United States mislead their constituents in order to pursue hidden agendas. In laymen’s terms, my purpose here is to frame the “crooks” who inhabit the halls of power in Washington. Perdue is one of Donald Trump’s biggest supporters and a man who has been key in stabbing working-class Americans in the back for decades. I won’t get into his role in the garments industry, or how his connections in India affected the textile industry in America. My best friend from high school worked for some of the companies Perdue was an executive for, so I have some knowledge of the destruction of the textile industry in the United States. All this is in the history books and largely suppressed now, but Perdue’s role in spending trillions in taxpayer dollars to “protect our homeland” from ghosts is my focus today. Perdue has just voted to continue support for spying on people across the globe by propping up the Foreign Intelligence Surveillance Act. My state’s U.S. senator is in bed with the military-industrial complex. I can say this because he is. Proud of his Wall Street accolades for Fortune 500 companies he helped restructure for profit, Perdue also does the bidding for Georgia’s stake in U.S. militarism. This release from the senator’s press department tells us David Perdue cannot be trusted to level with the people of Georgia. His letter in response to me, drafted by some paid PR hack, it’s an insult to intelligent Georgians and Americans. The “narrative” spit out of the United States Senate as a slap in the face to us all. Here is a part of the response to my honest plea for peace in Syria. There’s a huge problem for Perdue and his fellow senators though. With a trillion-dollar intelligence community standing behind, the entire U.S. military complex, Homeland Security, the FBI, the U.S. State Department and the most sophisticated space hardware ever created, David Perdue cannot prove the Assad EVER used chemical weapons on his own citizens. But he has the unmitigated gall to have his minion mail me about this geopolitical catastrophe! Perdue’s people should learn to use Google. I now have little doubt that Perdue joined in the Donald Trump “shithole” nations conversation. Let’s examine what the official interim report from the Organization for the Prohibition of Chemical Weapons (OPCW) released July 6th concerning the Douma and Al-Hamadaniya and Karm Al-Tarrab in 2016. OPCW essentially has no proof there was ever a nerve gas or chlorine gas attack at any of the sites mentioned. But the BBC, Reuters, and David Perdue’s country club double down on worldwide chaos for big bucks. Furthermore, the OPCW report mirrors rising evidence that of Britain’s Skripal nerve agent circus. In the latter incident, the world has been asked to believe that a second-rate double agent was poisoned with one of the world’s most deadly nerve agents by pesky Russian spies and that he AND his daughter survived. Again, there is no shred of evidence given. Look at the assessment from OPCW on the Hamadaniya and Karm Al-Tarrab incidents in 2016, the incidents that media such as The New York Times reported as true. These are the same attacks Fox5 in Atlanta reported Senator Perdue lambasting Assad over to justify Trump’s missile attacks. I find it funny that I cannot find retractions on these stories, or at least updates. But let’s move on. Perdue’s voting record so far reads like that of wild man Senator John McCain, the militarists’ poster boy for revenue streams. But Perdue is an even more deadly kind of human carrion. While McCain focuses primarily on fomenting foreign wars and creating insurgent revolutionary armies, Perdue is still backstabbing American workers. This Greg Bluestein story at Politically Georgia tells of the Georgia senator’s cousin, former Georgia Governor Sonny Perdue’s role in saving NAFTA. On the down low cousin, David played politics on the horrendous trade agreement he was part of as an executive for companies like Sarah Lee Corporation, Haggar, and Reebok. Perdue cut his Fortune 500 teeth in Asia for Sara Lee. This report from the time frames the divestiture of the American worker that Perdue and his colleagues in Asia at the time were certainly part of in the late 1990s. This was back when globalization efforts began for big companies and in particular garment and textile companies that my aforementioned friend helped close hundreds of factories for. States like North and South Carolina were gutted by globalists like Perdue, but somehow people forgot. This POLITICO story from 2014 condemns Perdue for what he is, a curmudgeon of the big business elites. 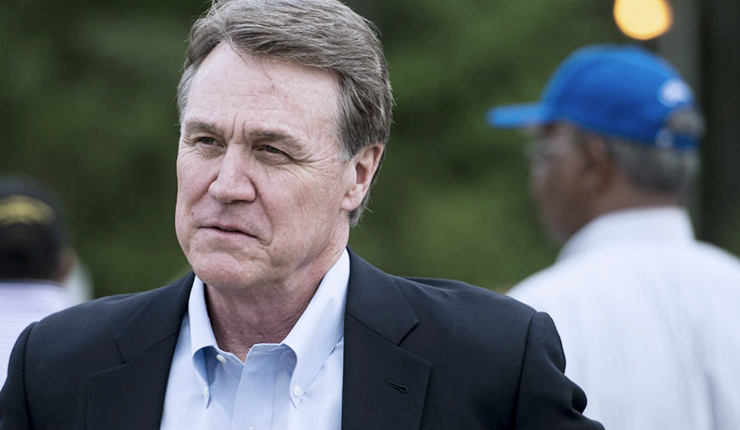 The story of David Perdue is a story of the destruction of everything America stood for. The story of David Perdue should be a lesson for all those hundreds of thousands of Americans who either died in some useless war overseas or for those well-paid textile workers who ended their careers working flipping burgers at McDonald’s. Walmart part-time workers who have virtually no benefits, gifted weaving and sewing talents, maintenance men who held America’s plants together, and even executives like my best friend owe their plight to men like Perdue. Worse still, the lies and arrogance still flow in the form of mindless form emails that just flat out lie to constituents. Washington D.C. has become a cesspool. Men and women like David Perdue are the cause of blood flowing across the planet. And they don’t care. The rationalizations, their amoral business demeanor, bragging about being FOR the big boys. Georgians should drag people like Perdue out and tar and feather him like in days gone by. But instead, men like Perdue putt on the perfect greens of the legendary Sea Island golf club. They dine on freshly ironed fine linen tablecloths at The Cloister. Representatives like David Perdue can even take up aristocratic sports like falconry or cruise the salt marshes aboard the Sea Island Explorer yacht. It’s not the blood money these carrion fuels their lifestyles with that bothers me. I’d as soon have a King or Queen in power anyhow, based on what I’ve seen of democracy. What boils my blood is the arrogance of these people. It burns me to get a form letter from some celebrity wannabe PR person spitting out the same lie I fight against each day. While a few of us struggle to help people discover the truth, the Fortune 500 braggarts go about business as usual, adding insult to all our injuries. They’re killing the world, and my countrymen are letting them. So there, David Perdue, there is your response to the “do-not-respond” form email. And if you have the proof on Assad and Putin, let’s see it big mouth. You are a transparent senator; I hope you go to sleep knowing this.